Halloween’s just around the corner, but that doesn’t mean you have to spend copious amounts of money on decorations! Instead, use what you already have lying around the house to make cute and spooky Halloween decor! These are ominous and spooky and best of all, safe! Learn how to make these and add a little spook to your house. Rustic and spooky! Make these vases and flowers easily with a few supplies and things you probably have around your house! Not only can you use trash bags for, well, trash, but also in a creative way making this recycled plastic trash bag wreath. It is a great way to upcycle some of those old baked bean cans and turn them into a fun filled Halloween crafty afternoon followed by a great Halloween party game! One of the things I like about this craft is, other than being super simple, it is also quick and can be completed by a kid with a little help. Halloween is wonderful excuse for getting my hands dirty and starting up a new project. 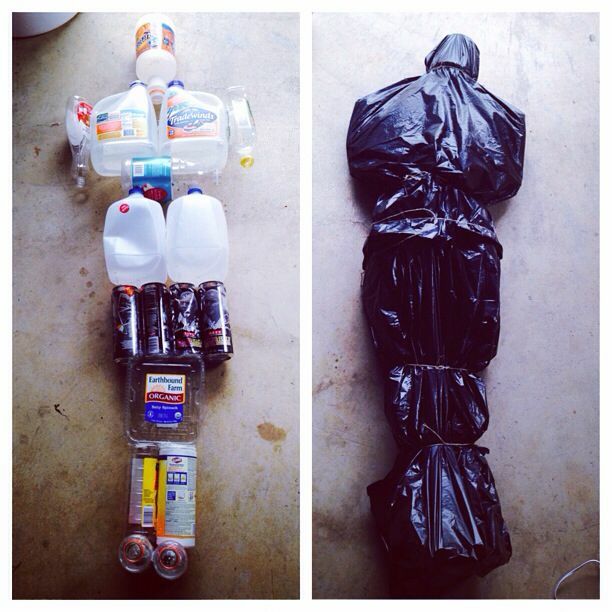 To start out your Halloween in your home, go with a creepy old coffin made from pallets. You can’t recycle K-cups in the usual way, but now you can repurpose them for a fun decoration this Halloween season! Good job thinking outside the box! These are honestly more “cute” than spooky, but that could be the perfect fit for your kid’s Halloween party! And here’s the thing, you can use the tissue boxes that are already around your house! This Halloween craft for kids couldn’t be any easier and, goofy or spooky the kids can let their marker filled hands decide. You can make a spider web with just some yarn and tape. BONUS: Write messages in the spider web, like a haunted Charlotte’s Web. Cut some eye holes in some old toilet paper rolls and stick a glow stick inside. Instant spook! DIY Halloween decorations do not have to be expensive. If you’re like me, you save just about everything! You never know when you might need it for a future project, right? I have a clear plastic tote labeled “what-nots” that I throw all of these extras in. Grab your “what-not” box or junk drawer and some wood scraps, and you’ll have everything you need to make your own recycled pumpkins. It’s adorable, and something that will be a fun, long-lasting project to make with your kids. No more stooping over to pick up the candy bowl every time the doorbell chimes- my back is already thanking me. Plus, isn’t the Halloween candy bowl ghost cute? Decorative, functional, and thrifty. You can make a great looking witches broom for almost free and easily in a few minutes. There are so many creative ways to use these DIY witches broomsticks indoors or outdoors in your Halloween decorations or Harry Potter themed parties: on a mantel or a shelf, as part of a Halloween wreath, garland, or a great table centerpiece, next to a planter by the door, with pumpkins, and more! Made from plastic medicine and vitamin bottles, and a spice tin. Boring and unremarkable containers are now something worth looking at and maybe even using again. Using a large light globe found at a thrift store, learn how to make a realistic moon globe for Halloween! These easy hanging Halloween props use mostly Dollar Store materials and can be made for about $5 each. They are fun to make and look great indoors or outdoors, so grab some supplies and hang a few around your house this Halloween! Thank you for your input! Have a good day!